Broken nose of a windsurf board, a sad sight indeed. Beyond repair, because the board is old. Even sadder, a broken arm (my oldest daughter’s). 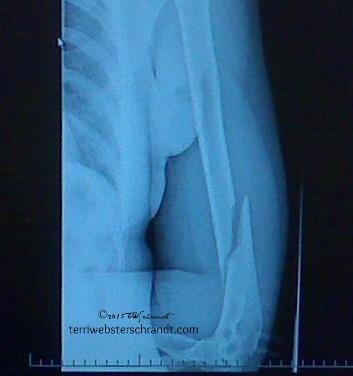 A spiral fracture of the humerus bone in the upper arm. Repaired with stainless steel plate. I bet your daughter didn’t find it very humerus…😉, hope she’s not in too much pain! Hee hee! No not any more–happened a few years ago! thank you! The windsurf board is in pretty bad shape and I hope your daughter’s arm healed ok! Board is beyond repair. Arm all healed. thank you, Lia, and I hope you had a great weekend! I’m glad her arm is a-ok! Thanks, it was a wonderful weekend! She’s all healed up,was from 6 yes ago. She has a great scar though. Taking a break from sailing as I post this reply 🙂 hope you are sailing this weekend! I’m sorry about your daughter’s broken arm. I hope she has healed or is healing completely. The surf board looks pretty well cooked. LOL! Thanks, PJ! She’s all healed now, was 6 years ago! Ooh goodness, that does look like a nasty arm break! Love the photo of the wind surf board too, even if it is beyond repair. Glad she made it through. Poor Board! Youch!! That arm!!!! Hope she’s ok! Yes, it was traumatic at the time, but it was 5 years ago. she has a gnarly scar though. So she’s got a cool scar and a great story to go with it! Ouchie on the broken arm… glad its long healed! Gook healing for your daughter’s broken arm. Ouch, hope they are both repaired quickly (the board and your daughter). Board, never, but daughter, yes. This was 6 years ago but she has some stories to tell. She even wrote her master’s thesis in Mechanical Engineering on this when her doc mentioned the word “torque.” And thank you, Josh! !